Between Stitches: 2 done, 2 to go! I'm motivated. A comment led me to be invited to participate with the New Years' Eve UFO Challenge happening on Finn's blog, Pieces from my Scrap Bag. The idea is to pledge to complete an amount (you decide) of UFO's before Year's End. Since we're already well into November, I didn't have a spectacular number of UFO's that I could realistically finish in time, but I did have a stack of quilts ready for quilting that I would love to have done so I could get a bit of a fresh start in the New Year. Besides, having stacks of unfinished tops and projects just cuts into the fun of it all, doesn't it? I can't stare at them anymore, and trying to hide them doesn't help either ( because we all know they're there, lurking somewhere...), so getting a few done feels good. "Cherry & Chocolate": a quilts made, oh months if not a year ago! Simple straight line stitching put it all together to make a nice little lap quilt. Here's a quick snap of the back. I've also been trying to use up my stash lurking in the closet, and this is part of my ongoing "make-do" project. After all, what's the point of keeping those fabrics in the dark? 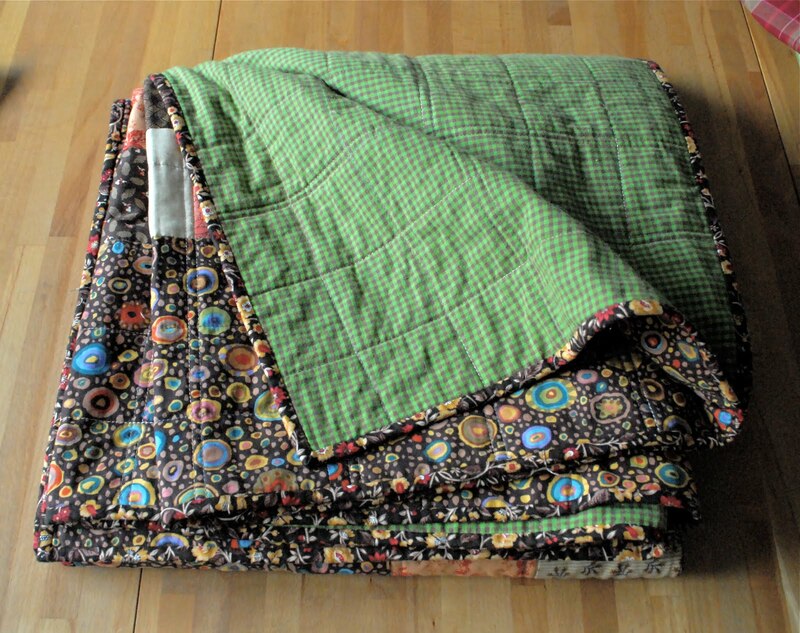 I'm pulling them out and working them into my quilts so I can enjoy them! The evening I finished the last stitch of this quilt my daughter snatched it up and took it to put on her bed; it hasn't been seen since...kids! Here's the back of the quilt - another bit of stash that can now be put to good use. In the meantime, I returned to the sewing machine guy this weekend and he checked out my Pfaff. Turned out the "shredding" of my thread was due to the plate not being centered to the needle. As the threaded needle moved up and down, the thread chafed against the plate, causing the thread to shred and break. Mystery and problem solved! 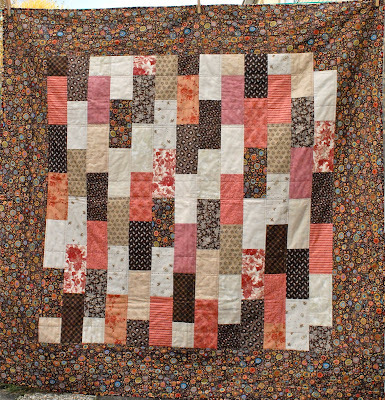 Now I can go back and try my hand again at free motion quilting. Quilt number three is on the table and ready to go, so let me get to finishing! Oh how I love Chicken Soup. The border fabric is wonderful, (I love paisley of any sort) and you are right, the gold binding is perfect for this. One teacher I had enforced that binding was your last chance to "make it right". You certainly did. Have you tried wool batting? It's washable, very soft drape to it, warm in the winter, cool in the summer, hand quilts like butter.